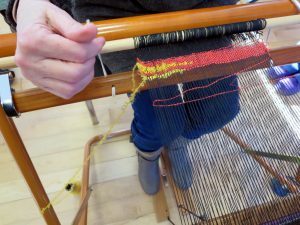 We were delighted to welcome Rosie Green from SaoriMor in Bangor, North Wales who introduced us to the concept and technique of Saori Weaving. The ‘sa’ syllable means the same as the zen word ‘sai’ meaning everything has its own dignity and ‘ori’ is the Japanese word for weaving. It was developed almost fifty years ago in Japan by Misao Jo who, sadly, has recently passed away aged 105. 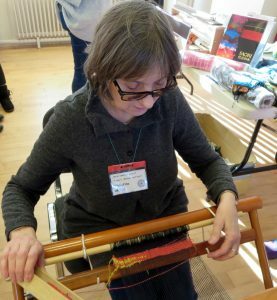 Rosie took us on her journey first experiencing handweaving on a textile course at West Surrey College through a variety of jobs but always returning to weaving. She discovered saori from a book describing the making of clothes from strips of fabric and eventually had enough funds to visit Japan and study with Misao Jo. This led to the setting up of Rosie’s Saorimor studio in Bangor in 2014. 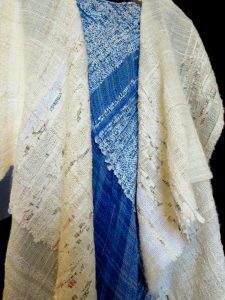 Having discovered that a mistake becomes a design feature Rosie embraced the philosophy behind saori: ‘No rules, no mistakes, just self expression through freestyle weaving’ and went on to produce simple garments from lengths of cloth without the need to cut the fabric. Simple seaming and clever positioning of armholes can make shrugs and wraps. More complex garments can be made with a minimum of cutting and sewing. The unique, fold-able looms come in two sizes, may have four shafts, ready wound warps are available in wool or cotton and there are accessories, designed by ‘Number Three Son’ for example, to make the job of threading easier.